Maybe you're thinking of dressing up like a king or a queen, envisioning heaping piles of coinage and blackbird pies. But that's not what being a ruler is really like! When you're the wealthiest and most powerful person in the realm, you're everybody's first call when something breaks and they need help fixing it. You're not just some fancypants prancing around in their puffy sleeves and twinkling crown: you're like a well-dressed 24/7 plumbing service. And Renaissance plumbing is not something you want to have to fix, no matter what you're wearing! So we made this fine Noble Renaissance Man Costume for people who crave a life of leisure. Sure, somebody wearing an outfit like this probably doesn't bathe in coffers overflowing with gold florins. But they also don't have people knocking on their door at all hours because a kitty cat or pigheaded goat is stuck in a tree again, and nobody else can afford a ladder. A Noble Renaissance Man like this is free to tend his modest parcel of land or become learned, to play chess or train in swordsmanship. Or all of the above! And maybe he's not covered in gold and jewels like the chump wearing the crown, but we figured that this guy would still have some pretty stylish clothes. 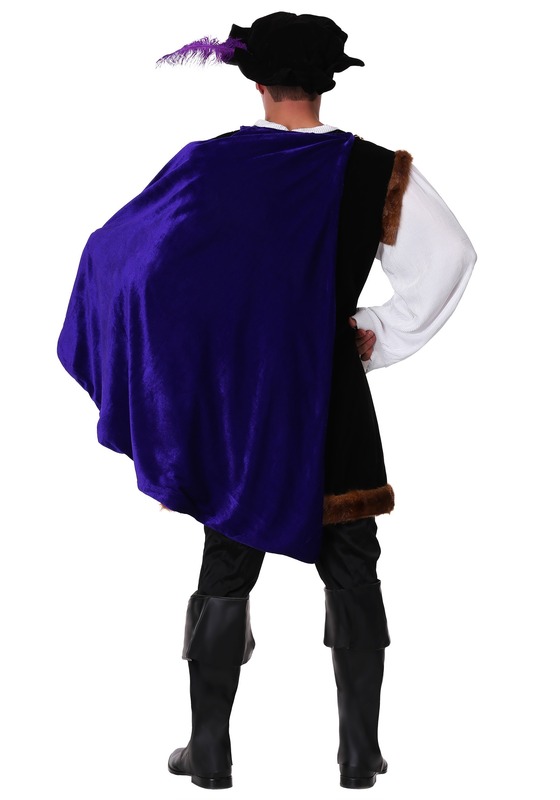 So we made his tunic and bonnet out of velvet. Then we lined his cape with satin, and fastened it with a flashy golden chain. We even threw in some great-looking boot covers and stuck a feather in his cap for good measure. It's a complete look, ready for a costume party or Renaissance Faire! I bought this for our school's Shakespeare day. I will be finding some fun-loving teacher to wear this fabulous costume. I was very pleased with the quality of the costume. Great quality, and I love the style. Absolutely met my expectations. The costume was a big hit at our Renaissance event. 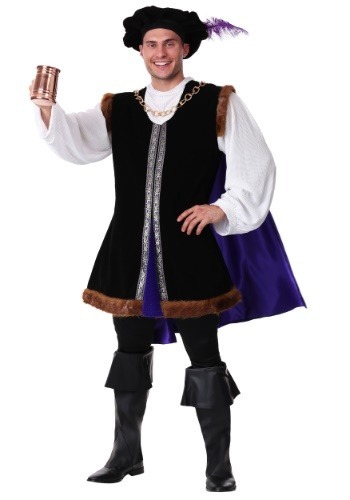 Ideal for a Renaissance Faire, a madrigal dinner, or for Halloween. Noble price of the renaissance! This costume was amazing. I was really impressed that it came with everything shown. Pants, boot tops and everything! I enjoyed the details as well- the chain, fur trim and the cape. I wore this to my local renaissance fare this year and got a bunch of compliments from the fare workers.